There’s hardly anything nice to say about fleas. 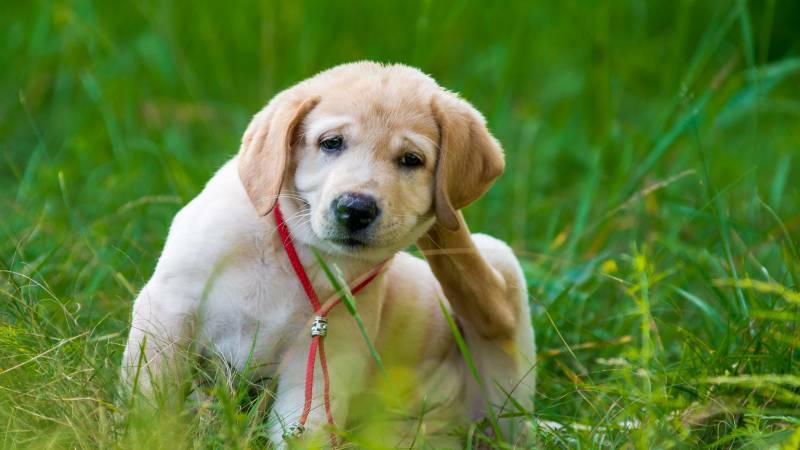 Of all the pet problems veterinarians treat, fleas are the most common. And fleas are more dangerous than many pet owners think – they can cause anemia and introduce tapeworms in animals, and transmit diseases like typhus to humans. Unfortunately, there are more than 2,000 species and subspecies of fleas, according to PetMD, and they’re astonishingly adept at finding hosts. Fleas are surprisingly robust creatures that can survive up to 20 months in pet fur, carpeting, furniture, and backyards. Given their tiny size, infestations aren’t always easy to spot. Here are five telltale signs of you’re facing fleas, and how you can get rid of them. In dogs, PetCareRX reports that flea allergy dermatitis is the most common flea-related skin ailment. It’s the result of a reaction to flea saliva; there are antigens in it that your dog’s immune system doesn’t recognize. Dogs typically develop the allergy in the first five years of life. If you detect swelling or red, bumpy spots that are warm to the touch, your dog probably has FAD. If left untreated, symptoms will worsen with age. Cats can develop this allergy as well. If they’re hypersensitive to flea saliva, just one bite can result in a serious reaction. Search your cat’s groin and belly. Inspect the area around the base of the tail. Inflammation, bumps, and scabbing are signs of FAD. All dogs and cats scratch and lick themselves occasionally, but obsessive grooming is a red flag. The actions will seem intense and frantic. For example, you may notice your pet suddenly whipping its head around to bite its own skin in frustration. The itchiness and discomfort of flea infestation is sometimes unbearable, and pets do even worse damage by scratching and biting affected areas. Doing so invites infection and secondary disease. Excessive shedding and bald patches on the skin are a dead giveaway that your pet has fleas. They’re caused by scratching and rubbing against the ground, carpet, or other surfaces to ease discomfort. When the fleas and FAD are under control, you can expect your pet’s hair to grow back in a few weeks. You might notice slight color variations in the new growth, but they are no cause for worry. Flea-related hair loss is not as serious as alopecia, which PetMD says can affect a dog’s skin tissue and the immune, lymphatic, and endocrine systems. Hair loss is drastic and readily apparent. You’ll see numerous circular patches of bald skin that are inflamed or scabbing over. Mange, which is transmitted through the demodex mite, is the most common cause. In cats, a cancer diagnosis, a nervous disorder, mange, fungal issues, or hormonal imbalances can cause alopecia. Fleas can consume amounts of blood up to 15 times their body weight. That’s a lot of blood loss for a pet, and it can result in lower red blood cell counts and regenerative anemia. Pale gums are one sign of this condition, and a sign that your pet is plagued by fleas in addition to flea-related conditions..
Flea dirt confirms what you’ve suspected all along: these pests are truly disgusting. Flea eggs are much more difficult to spot. They’re white or transparent, and they don’t stick to pet fur. If you regularly see residue that looks like dandruff or salt on your carpet or furniture, you probably have an infestation. There are a number of flea remedies on the market, and your vet can give you the best advice about which to use. Treatment should be tailored to your particular pet, so call or schedule a visit. Make sure that any product you choose is specifically labeled for the type of pet you have. Check for environmental and human health safety precautions, and carefully follow the maker’s instructions. The most common options for pet flea removal or relief are topical medicines, such as flea drops, shampoos, and powders. Some vets recommend flea collars to keep fleas at bay, or will prescribe flea pills for quicker resolution. Using a vacuum cleaner and the attachments, do a thorough job of cleaning the rugs, upholstery and pet bedding at least twice a week. Be sure to discard the used vacuum bags. If the appliance is bagless, wash the canister with warm, soapy water. Wash pet bedding in hot water as often as possible. Regularly groom your pet with vet-approved flea shampoo and a flea comb. There are countless resources on the internet for preventing and treating fleas. Some are safer and more effective than others, so talk to your vet before you waste time and money or endanger your pet’s health. If you’re interested in finding flea solutions for your pet or home, start a search today.